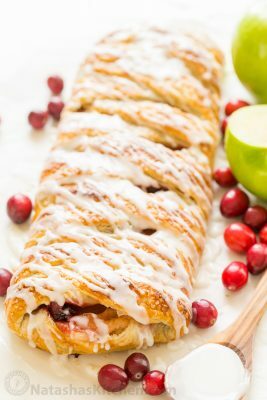 An Apple Danish Braid loaded with juicy caramelized apples and cranberries in a flaky pastry shell. This braided apple danish is easy and disappears fast! Place a large pot or deep skillet over high heat. Melt 3 Tbsp butter and stir in 1/4 cup sugar. Add sliced apples and stir until evenly coated. Add cranberries and let the mixture sit 3 min to caramelize before stirring. Cook apples and cranberries a total of 6-7 min, stirring 3 times or until apples are lightly caramelized. Transfer apples to a plate and let cool until just warm (not hot). Unfold thawed pastry over a lightly floured work surface and roll it in one direction to make it a total of 2 inches longer. The natural folds in the pastry will guide your process. Place the cranberry apple filling down the center of the pastry, keeping it in the middle third and leaving 1" of space at the top and bottom of the pastry. Cut away the top corners from the left and right thirds of the. Cut 8 equal 1" strips along each side, leaving 1/2" of space from the apples. Cut away excess dough at the bottom corners. Fold down top flap of dough and pinch the corners down to seal. Fold in the side strips, alternating from left to right. Fold up the bottom flap, pinching the corners to seal then finish folding in the last 2 side strips, pinching the corners to seal. Transfer to a baking sheet lined with silicone or parchment, brush with egg wash, sprinkle with coarse sugar, and bake at 400˚F for 18-22 minutes (mine was perfect at 20 min) or until top is golden brown. To make the glaze, stir together 1/3 cup powdered sugar with 1/2 Tbsp milk. Once the braided apple danish is at room temperature or just warm, drizzle with glaze, slice, and enjoy!